Their fate hangs in the balance… if not… they will not survive! A thrilling Star Trek: Voyager story! Once captured by Starfleet and sentenced to life in prison Maquis leader Chakotay escapes, becoming even more of a threat to the fragile Federation peace treaty with the Cardassians. With his new Intrepid class starship Voyager, along with rumors of an alliance between Chakotay and the Bajoran resistance fighter Ro Laren, the Maquis leader is a danger Starfleet cannot ignore. Armed with orders to find the outlaw at all costs, Starfleet Captain Kathryn Janeway heads her nova class ship, The Explorer, into the Badlands. Once there she encounters not only Chakotay but also a danger far worst than that of the Maquis, Cardassians or Dominion. Thrown together into the Delta Quadrant, seventy-five thousand light-years from Federation territory, Starfleet captain and Maquis leader must join together to survive! Can they overcome their hostilities and distrust of each other? Can Kathryn Janeway overcome all her training to ally herself with an enemy of the Federation? Unknown to both of them, their critical situation is enhanced by the hatred of two Starfleet officers. Two officers, who will stop at nothing to enact vengeance upon Chakotay, even if it means taking the life of their own captain! Will they survive? Can the crews work side-by-side? Their fate hangs in the balance… if not… they will not survive! Starfleet Treachery is based on CBS Studios Inc.’s science-fiction television series, “Star Trek: Voyager”. There are two books for this story. Click through to visit Starfleet Treachery, Book 01. Janeway’s Father is alive, Cavit is alive, Capt. Kathryn Janeway is the commanding officer of the science vessel, U.S.S. Explorer, Cmdr. Chakotay is the outlaw, leader of the Maquis and commander of the Maquis Intrepid-class ship. There is division between the two crews, Starfleet and Maquis play the game of hunter and the hunted, but the bond between the two opposing crews are unmistakably present as they work to find a way back to their home world, defeat an unfamiliar and hostile race as well as unsuspecting enemies within. 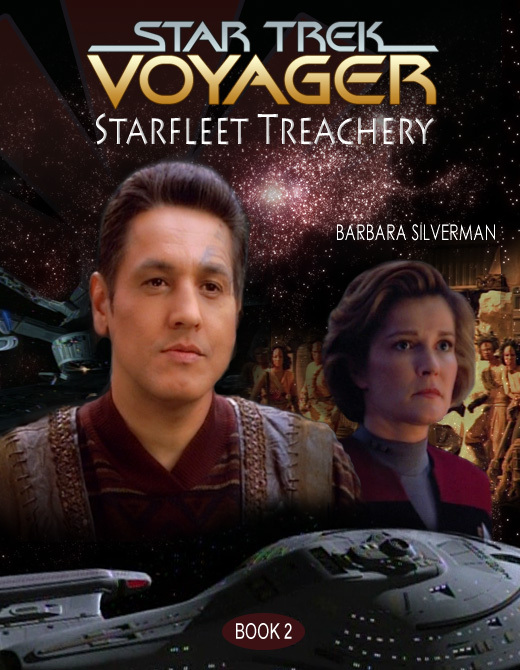 One may be enticed to grab their Star Trek: Voyager DVDs to watch after reading Starfleet Treachery as it brings in familiar scenes from “Caretaker”, mixed in with new ones to make an interestingly-written, page-turner. A more tender-filled crew, more light banter amongst sinister events, this story makes for interesting comparisons and then some which reveal to be quite shocking! ©2015 Site design by Julia and Tania. Site design and Julia and Tania site images are copyrighted to Julia and Tania. All contents not belonging to Julia and Tania on this site belong to their rightful owners.